Designed especially for order picking, stocking, or delivery work. Available with flush shelves or with 1-1/2" retaining lip. Completely welded to form a solid unit, this 12 ga. steel cart stands up to hard punishment. Mold on rubber wheels are quiet and tough. 2400 lb. cap. 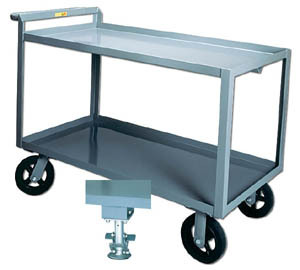 model is available with floor lock to hold cart in place when at rest. FOB Shipping Point. Product No. Cap. (lbs.) Shelf W x L Wheel Size Wt. (lbs.) Price Ea.